(h)ear #55 / buro neue, Betahuis, Wilhelminaplein 25, 6411 KW Heerlen. 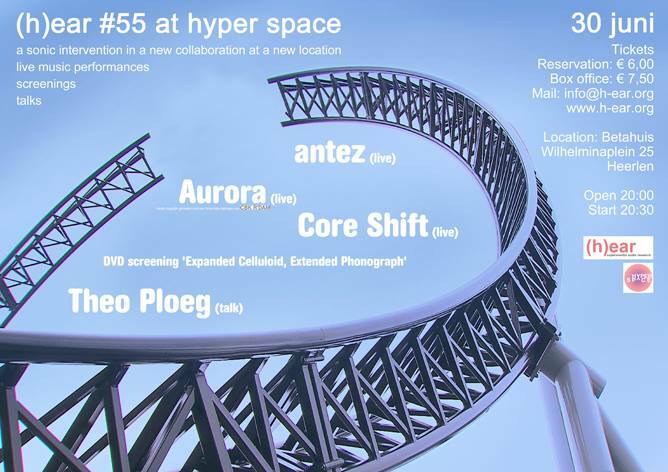 Performances by antez (FR) + Aurora (NL) + Core Shift (NL). Curated by Mike Kramer. A (h)ear event in collaboration with buro neue. FB event. Open 20h30. Start 21h00. Pre-sale ticket 6,50€, Box office: € 7,50. 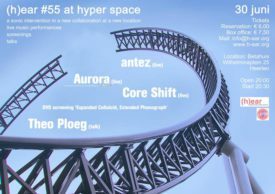 Reservations: info@h-ear.org (subject: (h)ear 55). Van der Putten’s performance is supported by CBK Rotterdam (Centre for Visual Arts Rotterdam).